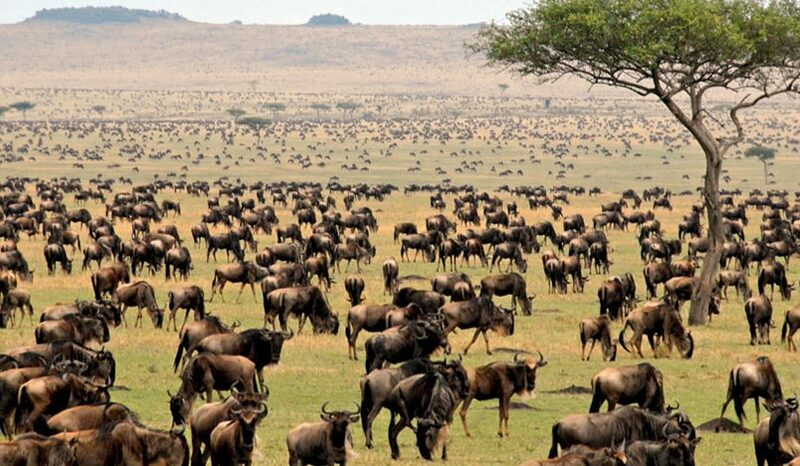 Serengeti National Park has always been on of the most coveted parks in the world. Renowned for its jaw-dropping wildlife and unbelievably classic scenery, Serengeti National Park has remained to be every traveler’s bucket-list experience. In fact, thousands of adventurers from all over the world swarm to get that piece of wilderness experience to treasure for a lifetime. But, did you know that the Serengeti has several different areas? Spanning about 14,750 km², the savannas of the park is divided into regions: northern, southern, central and western. Each region highlights certain animals and animal movement. Northern Serengeti includes Kogatende and Lobo areas. Bologonja Gate, Sand River Gate, Sekenani Gate, Klein’s Gate, Lobo Airstrip and Kogatende Airstrip can also be found here. When it comes to landscapes, the northern region of the Serengeti will never disappoint. You can expect to see a perfectly mapped diverse terrain made up of hills, riverine forests, plains and rocky outcrops. The immense Mara River also cuts through this area, and provides a setting for the iconic, mind-blowing migration event that’s dubbed as “The World Cup of Wildlife”: the Mara River crossing. 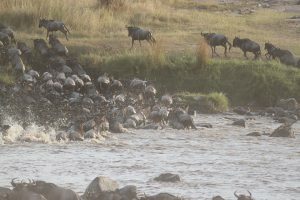 During this epochal river crossing, millions of migrating hooves leap off the steep riverbanks and struggle to survive among the fast-flowing raging waters as well as the large Nile crocodiles and territorial hippos that guard the river. However, these hooves need to cross to get to Masai Mara in Kenya to the north, where fresh grazing and water await. Hence, the world’s most amazing wildlife spectacle unfolds. 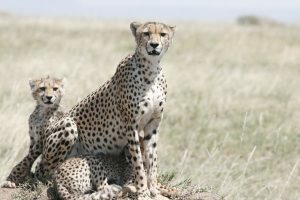 Aside from the spectacular wildlife event that happens here, the northern Serengeti area is also known for its cheetahs, one of the world’s vulnerable animals and fastest mammals. The cheetahs can be found on other parts of the Serengeti but they seem to especially love the northern plains. As there are not many permanent lodges or camps in this area, this can be considered a “quieter” place in the Serengeti. The best time to visit this part of Serengeti is around end of July to early October when the hoofed herds reach north. November is another excellent time because these migratory animals start to head back to the southern region. Southern Serengeti is probably one of the most visited areas of the park. It covers Ndutu area, Lake Ndutu and Naabi Hill. It is also very near Ngorongoro Crater and Olduvai Gorge. The southern sector of the Serengeti is characterized by flattened, open plains and short grasses, which makes game viewing exceptional all throughout the year. Lake Ndutu also provides ample opportunities to see incredible flocks of pink flamingos. Around January through March, southern Serengeti is taken over by hundreds of wildebeests, zebras and gazelles, including their babies as the dramatic calving season ensues. Naturally, a lot of predators are drawn by this phenomena, promising an action-packed scenery. Central Serengeti is popularly called Seronera. In here, you can find the famous Seronera Airstrip and the Serengeti Visitor’s Center. The beauty of the Seronera is, unlike much of the park’s regions which is pretty seasonal, the central area is full of animals all the time. It features a vast range of diverse ecosystems, encompassing grasslands, acacia forests and riverine areas. Hence, an incredible amount of animals settle in this area. At the northern part of the Seronera River Valley, you will find the Retina Hippo Pool – a waterhole that’s incredibly abundant with hippos. The view of massive numbers of hippos in one pool almost lets you not mind the stench at all. What makes any visit exciting is that the chances of seeing hippo action is pretty high, given that hippos are VERY territorial animals. The Seronera is also home to a string of amazing Serengeti camps since it offers superb safari experiences all year-round. This region is also the site for exemplary hot air balloon safaris. 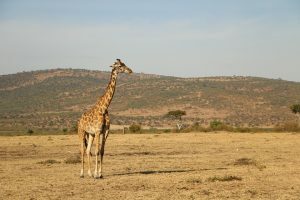 The Grumeti and Ikoma are both parts of the western Serengeti. Widely known as the Western Corridor, this region is popular as the “beginning” of the iconic river crossings. In June, the migrating animals arrive and congregate around this area. 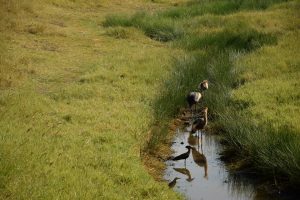 They will then soon cross the crocodile-infested Grumeti river, a “pre-World Cup” event of wildlife before they head to cross the Mara River further north. The Western Corridor landscape is hilly and wooded, with large forests of acacia. The best time to visit this area is around May to July to see the sensational migration. If it’s your first safari in the Serengeti, the best place to stay or concentrate on is Central Seronera. Not only will you be at the heart of it all, you will also be guaranteed an eventful game viewing experience everyday. The calving season is a Great Migration milestone that cannot be missed. If you’re coming around December or January to March, it is a sacrilege to skip Southern Serengeti as this is where the major action happens. For visitors who have come a long way to witness the river crossings between June and October, the western region of the Serengeti is the place to be. As an expert tip, try scoring tickets for shoulder season. During these times, you get to enjoy the perks of the peak season but for a lesser price since shoulder season (before or after high season) is not technically part of the peak season. If it’s already your second, third or more time going on a Serengeti safari, it’s best to explore areas you’ve never explored before. The usual ones that tourists visit are southern Serengeti and Seronera and even western Corridor. Why don’t you visit the “road less traveled” and explore northern Serengeti? You’ll be surprised how astounding it is – more untouched wilderness, amazing wildlife viewing, great chances for predator action and definitely more quiet. Serengeti National Park is indeed a must-visit wildlife sanctuary. Wherever you go, you will be rewarded with a safari experience you will never forget. The best way to experience it, however, is to really know where to go and when. It’s a good thing you already know the different areas of the Serengeti.